Wind whipped through the slate grey sky. 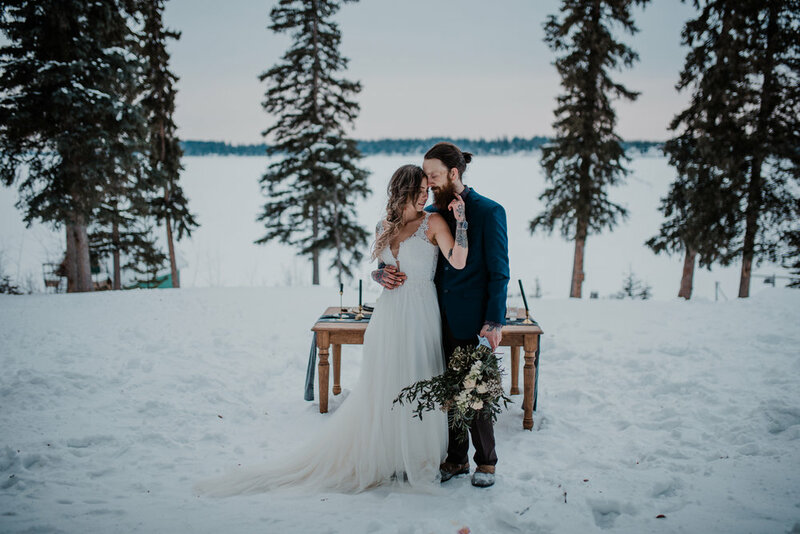 In the middle of a frozen lake stood Lacey and Jordan. 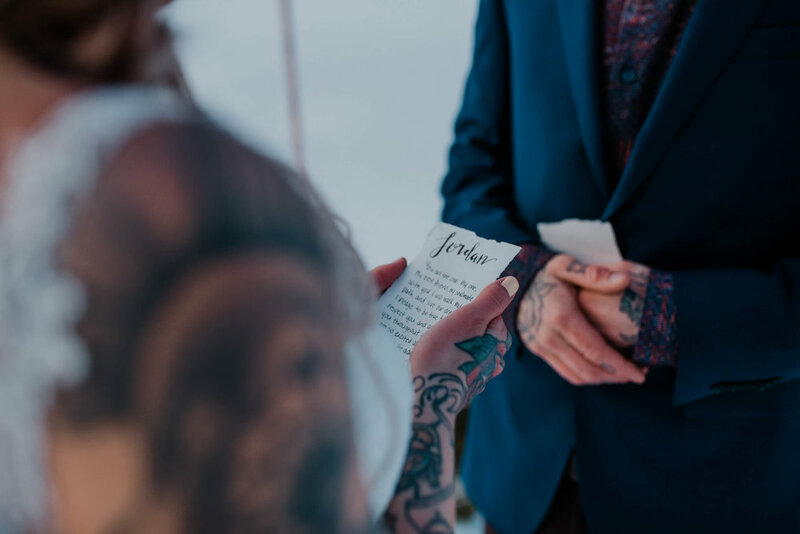 Lacey’s tattoos popped against her gorgeous gown as she whispered her vows to Jordan. Ten years of love led to this moment. 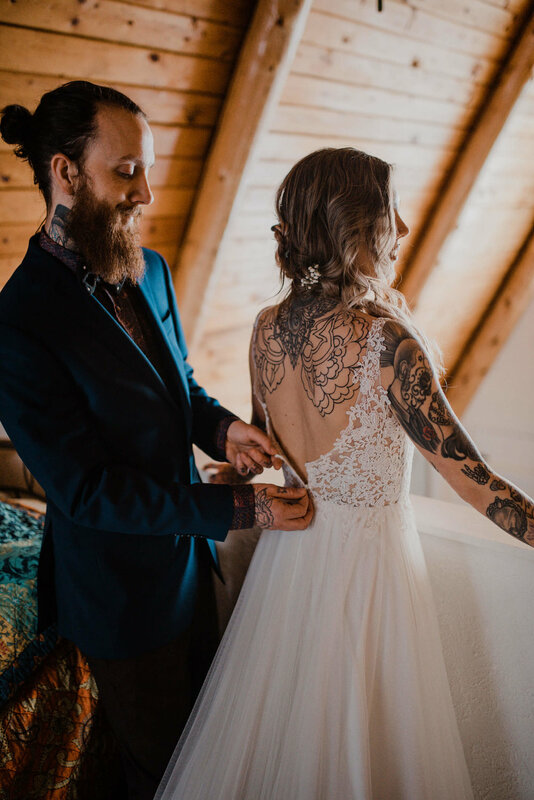 “I wanted to plan a styled elopement session that inspires and features everything untraditional about weddings, which was right up this couple’s alley,” photographer Kayla Hughes of Kreative Eye Studios says. 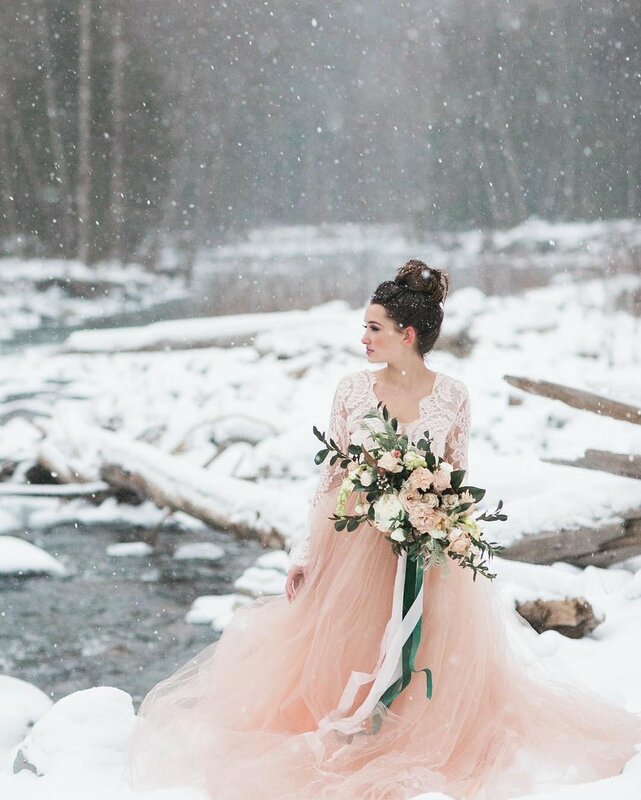 So instead of a summer elopement she planned a winter one. Instead of getting ready separately and doing a first look, the couple got ready together. Dramatic blue tones and a stunning custom ring added to the uniqueness of this shoot. 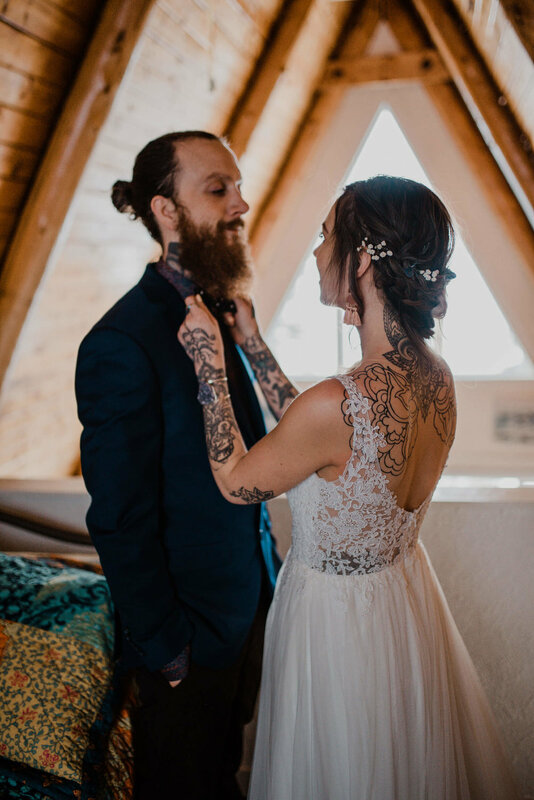 “All of the little details were custom designed and handmade for this particular day to match the couple’s style by some of Northern B.C.’s best vendors,” Kayla says. An elaborate table spread with gold candelabras, navy blue candlesticks, and a velvet table runner stood out against the snow. The blue and copper colored cake matched the decor and the vintage table perfectly. 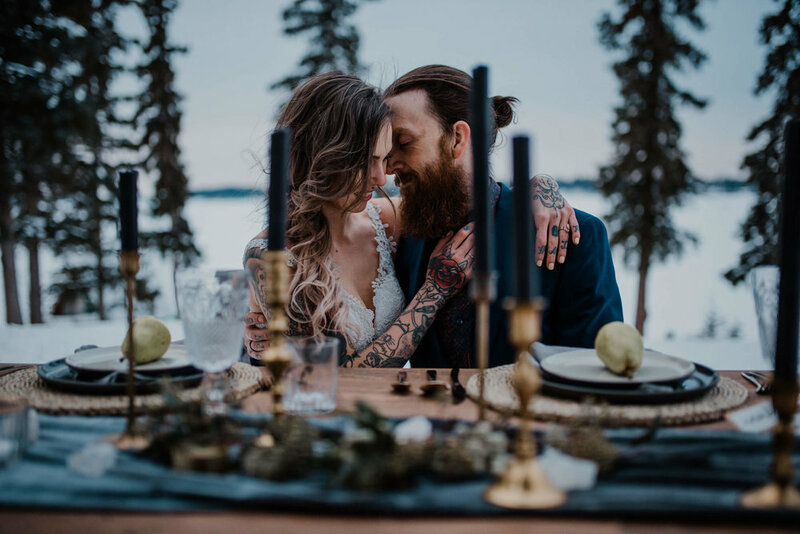 The couple enjoyed some luxurious hot chocolate and heart-shaped linzer cookies and Jordan played Lacey a song while the sky turned to dusty pink. When the sun went down Lacey and Jordan welcomed the night with sparklers. There’s something about this shoot that is few and far between -- it’s that feeling of meticulousness and thoughtfulness of putting something like this together. Maybe it’s also the ten years of love between Lacey and Jordan. Everything about this shoot feels like it was meant to be there. It’s completely true to itself, and we are so honored to share these beautiful photos here on PNWedding.